Five years ago an ambitious star trek group in second life who already had one successful sim called galaxy embarked on furthering their adventure and boldly adding another sim to their groups arsenal. 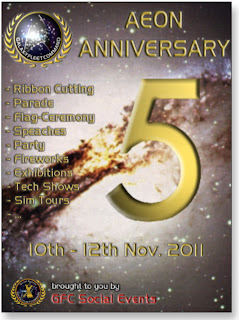 They called this sim Aeon and to celebrate its 5th birthday 3 days of fun and frolics has been organised. To launch the event was the customary ribbon cutting. The event project lead JD Matova gave a short speech and cut the ribbon to announce the fifth anniversary open. 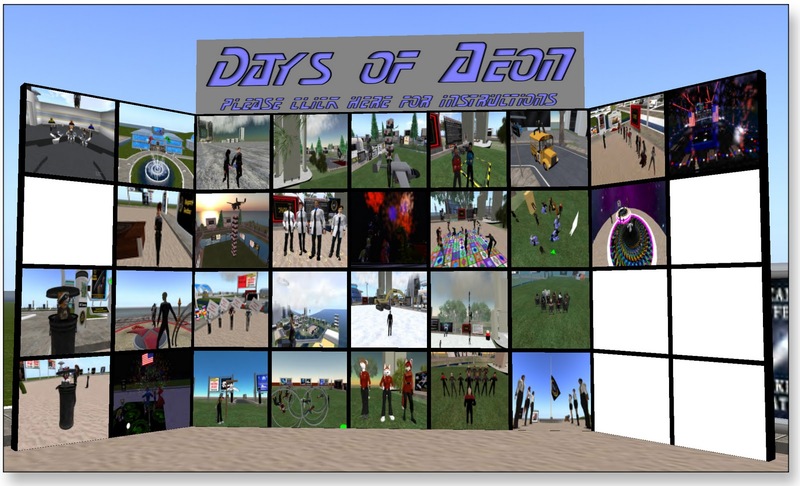 Earlier on in the day Fadm Bixby had an idea of a constructing a picture wall where members could simply place favorite photos of memorable events which had happened in Aeon. Richard Weatherwax hurriedly put it together and some of us dug deep into our inventory to pull out a few gems of the past, as the day progressed more pictures were added. To help celebrate the anniversary in GFC custom style someone thought, why not throw an impromptu party, so they slapped a dance floor down in front of the picture wall, chucked in some lights, a dance ball and we cranked up the boogie.